January is National Sunday Supper Month and what better way to celebrate than with a delicious dinner spent with family and friends. Sunday supper at our house always involves pasta; either with or without meat. This easy recipe is a family staple that comes together quickly leaving you plenty of time to enjoy each others company. So may I suggest you gather your family around the table and share a meal together. What starts as one time will easily and quickly become a way of life! Heat olive oil in a large pot, of medium heat. Add sausage and onion and cook stirring until sausage is brown about 6 minutes. Make a spot in the center of mixture and add tomato paste and red pepper flakes and cook, stirring, about 1-2 minutes. Add reduced tomato sauce and remove from heat. In the meantime bring 6 quarts of salted water to a boil in a large pot. Add pasta and cook until al dente. Drain, reserving a 1/2 cup of pasta water. Add pasta and 1/4 cup of reserved water to the sauce and toss to coat over medium heat. Add more water as necessary to make sure the pasta is well coated. Stir in the pecorino and basil and serve immediately. 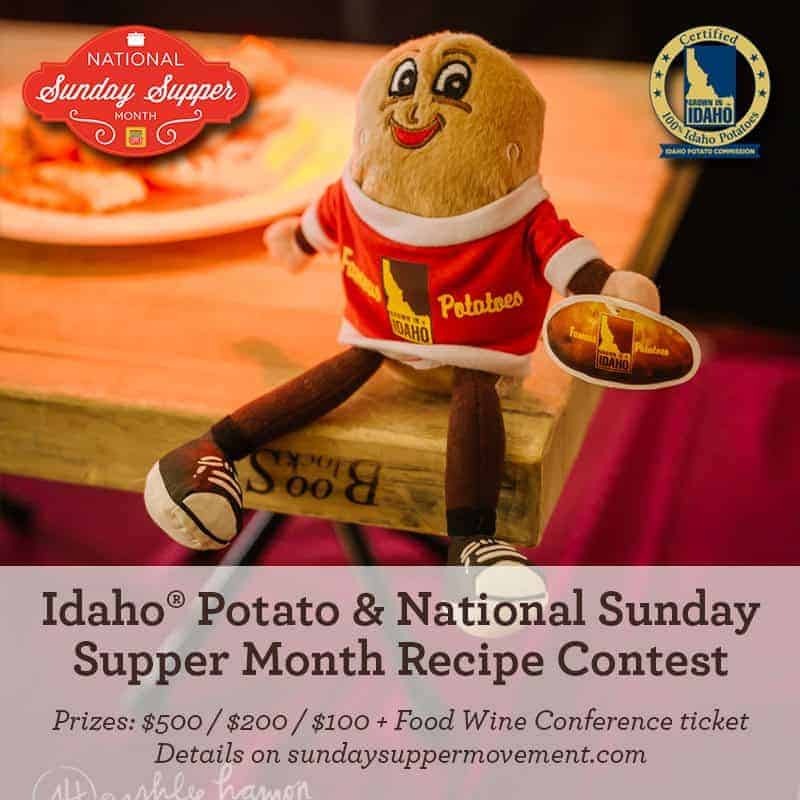 Help us celebrate National Sunday Supper Month by entering the Idaho® Potato Let's Poutine recipe contest, sponsored by the Idaho Potato Commission, with prizes of $500, $200 and $100, plus a ticket for each winner to Food Wine Conference 2016. All the rules and conditions for entry can be found on our Sunday Supper Movement website. To get more great Sunday Supper Recipes, visit our website or check out our Pinterest board. Would you like to join the Sunday Supper Movement? It's easy. You can sign up by clicking here: Sunday Supper Movement. gotta love a quick & tasty pasta meal! This is truly a family meal. Easy and delicious too! 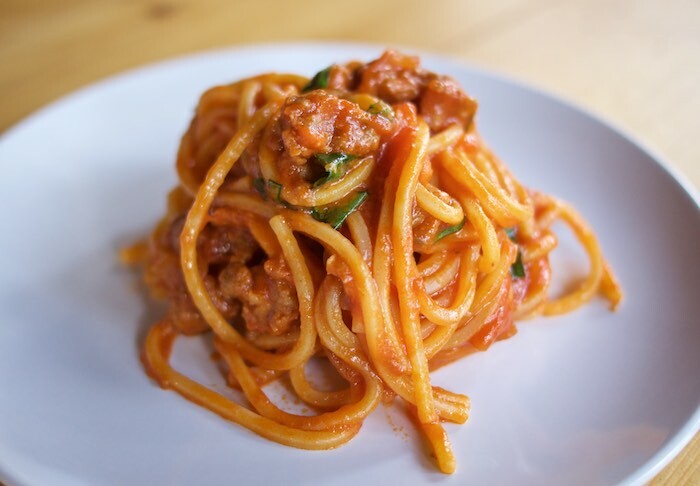 Perfect for a busy night, but yummy enough to serve to company---who doesn't love pasta with a lovely red sauce? This looks fantastic - and so quick and easy! I could eat a simple spaghetti every day! Looks great! I always love an easy pasta dish! I love that you added sausage! Such great comfort food, I'd love a big plate of this right now! Your sauce looks divine! Spaghetti is always a hit in our house! Perfect, all the ingredients required for a great sauce. Perfect recipe for those busy nights. This looks fantastic! On a cold chilly night, this is the perfect comfort food! Pasta in tomato sauce is one of my favorite things. Yours looks scrumptious! This pasta looks like perfection! It's the perfect recipe for cold winter nights. Yum! Pasta is pure comfort! Love this and I know my family would love this too. Such a delicious looking and easy meal! I love a quick and easy pasta, this one looks utterly delicious. It's a toss up between sausage and chicken as my favorite with tomato sauce. Judging by your photo you enjoyed a nice meal! I could eat pasta like this every night. YUM. Looks amazing. I'll have a double helping please? That looks amazing!